Most parents undermine the importance of oral care in babies, it is not well attended to before the child starts teething. Few parents know how to go about cleaning the gums and oral cavity of a newborn and the relevance of maintaining its hygiene. Tooth care forms an important part of your child’s oral hygiene. The entire process of digestion and nutrition intake starts from the mouth, which leaves it exposed to different kinds of bacteria, making oral care critical in babies. The eruption of the very first tooth of your child is a milestone. Right from the first milk tooth eruption till the last molar tooth eruption, your child to be taught how to take proper care of oral hygiene. Tooth care is not just for having healthy teeth, but it is also for having proper speech development, pronunciation, nutrition, digestion and more. What you often miss understanding is that milk teeth often lay a foundation for the permanent teeth. If their milk teeth are not attended to properly, then there are higher chances of having issues with their permanent teeth. You also need to watch if your child is eating foods that are most likely to cause cavities. Such foods should be avoided right from the beginning. This post is meant to educate you about teething and proper tooth care in babies. Teething and tooth care is critical for your child’s overall growth and development. The process of digestion starts from the mouth, and any pain due to poor maintenance in one or more tooth can lead to inadequate chewing of food resulting in bad digestion. Healthy habits in kids are to be reinforced or nurtured in their early years for then it remains forever with the child. It is often said that a child who brushes his teeth properly twice in a day may never have to see the dentist his entire life. Before Teething starts: You should start cleaning your baby’s gums even before the first tooth appears. For this, make your child lie in your lap. Take a damp soft clean white cloth and wrap it around your finger. Now, gently rub it all over the gums of your baby. Make sure to rub it over both upper and lower gums. You could also rub it over your child’s tongue to get rid of bacteria and milk deposits. Some moms prefer using little honey while rubbing over the tongue, as it gives a good flavour to the child. But, ensure that the honey is of high quality as otherwise, it may result in botulism in babies under one year of age. When the child has just started teething with the eruption of the very first tooth, then you can start using a toothbrush with very soft bristles. Choose the one with a small head to access the inner areas of the mouth. You may use any pediatric-approved fluoride-based toothpaste. Just squeeze a tiny amount say about the size of the rice grain and gently rub it all over the gums and the tooth which has just erupted. Cleaning teeth twice would be an excellent hygiene tip, but you may avoid night brushing if the baby sleeps while taking the last feed. 3 years old: Make sure that your child is continuing to brush twice in a day with your help. The toothpaste amount can be of the size of a pea. Till when your child turns 6 or 7 years old, your supervision is needed while they brush every time. At three years of age, the child will develop all 20-primary set of teeth. The lower front teeth appear first followed by the upper ones. How to deal with Teething? During teething, there may be soreness or swelling in the gums. 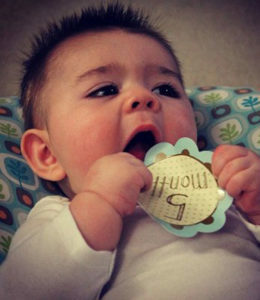 Your baby may act fussy and irritable, they may refuse to eat and drink. These symptoms are normal and can be dealt with ease. To provide respite to your baby gently rub a clean finger all over the gums. It will provide great soothing to your child. 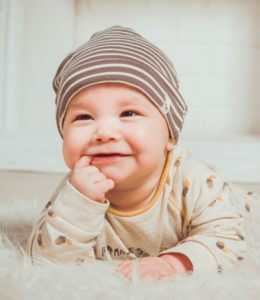 You may consider providing clean teether rings to your child to bite upon or may even give a clean frozen cloth squeezed to chew. This will provide great relief to the baby. If the pain persists, which will be apparent from the child’s behaviour, you may ask your pediatrician to prescribe any mild local pain killer. Typically, the soreness appears from three to five days before teething. Oral health care is crucial to be practiced right when the baby is born. Good quality teeth will last until the end and will keep the child away from the troubles of any dental procedures after growing up. Also, good oral hygiene brings down the chances of catching any illnesses related to the stomach. So, make sure that you follow this discipline right from when your little baby is born. Happy Parenting.